After threats and some truly hurtful assumptions about the incredibly caring people that work for New England Brewing Company we are working on finding the best way to amend this situation in a manner that both is respectful to those who are offended as well as a way that is manageable for our small company. So there are fans of the difficult-to-get beer voicing their opinion. Their hearts are in the right place, and I’m sure they’ll still buy Gandhi-Bot even if it’s rebranded. But this all comes a day after an attack on a French satirical magazine that insulted the Muslim religion; I don’t believe that there would be an attack on the brewery over the beer, especially because offense seems to stem from the other side of the world (although local liquor store owners have expressed their personal distaste for the imagery). However, religious and moral leaders matter to people in a way that goes deeper than rational behavior dictates. Besides, NEBCO wants to be known for its beer, not for threats against its labels. This comes after George Lucas threatened action against the brewery’s Imperial Stout Trooper label, which featured what was obviously a storm trooper. They covered that image up with Groucho Marx glasses, and already there have been suggestions that NEBCO do the same with Gandhi-Bot. NEBCO had to know that the image could possibly offend people; you’re talking about a beloved civil rights leader. You don’t have to be “politically correct” to sympathize with that. Would people balk at a Martin Luther King Jr.-inspired beer? I’m going to say yes. So now that NEBCO feels as if this decision is something worth reversing, I believe that’s worth honoring. If you want to take this as an opportunity to stand up for the right for free speech, there are other realities at stake here. NEBCO deserves to be known for it’s beer, not just its beer names. There are so many comments to NEBCO’s post calling into question what offends someone else. It’s silly for others to be offended, they say. I’m not offended, so why should you be? This is just flat out confusing to me: just because you don’t want someone to be offended doesn’t mean it’s going to be so. “The world has become too sensitive,” they say, displaying just the same kind of sensitivity they’re mocking. This entry was posted in Beer Snob and tagged New England Brewing. Bookmark the permalink. I have had a tough time with this issue. When I first heard of this beer and saw the label 2 years ago, it confused me, maybe because I’m older and I know Indian people and a little history. The local craft beer fans never mentioned anything about it. I’m not surprised there are people who are upset by the name and image. Many other cultures revere their spiritual and cultural leaders. 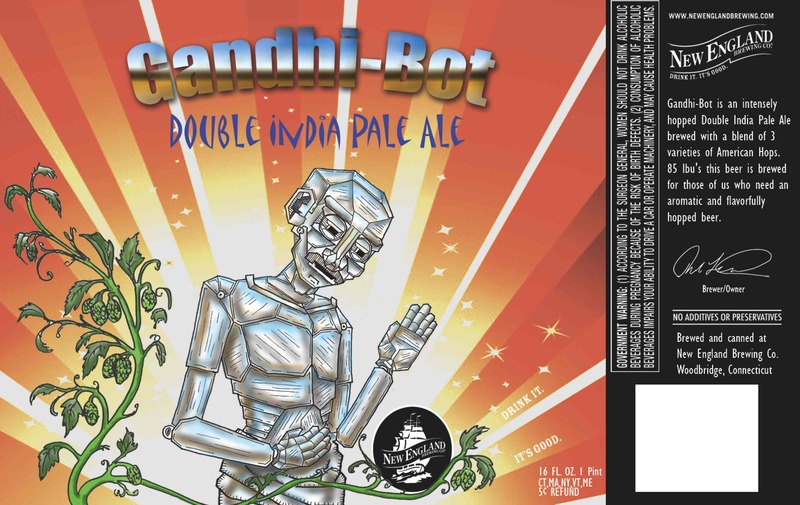 I’ve read comments ‘what if it was Jesus-bot or Obama-bot’, and I know most Americans wouldn’t think twice about the name as long as the beer is good. I think most of the current rage for craft breweries to think of clever names is getting old. Give me a Back East Porter, great beer that doesn’t require a strange name. NEBCO brews some excellent beers and I do like the staff. I would hate to see anything negative happen to them over a silly beer name.